← 2C. TXA in Head Injury? Practice Change: If Tranexamic Acid is not on your short list of life saving medications in trauma, it should be! It is inexpensive and has a mortality benefit in hemorrhaging trauma with a NNT of 67 to save a life. I will be giving it early and often in the ED. An amino acid that improves hemostasis. Tranexamic acid (TXA) has been used for 30 years in cardiac, orthopedic, OB, vascular surgery, etc, to prevent blood loss. A Cochran review of 25,000 pts showed a reduced need for transfusion of 39% with the use of TXA during these high risk surgeries. We are not completely certain how it works, but the most popular theory is that it is an antifibrinolytic that stabilizes clots once formed. It would do this by binding plasmin (required for clot breakdown) and preventing fibrin lysis. CRASH-II was published in 2010 and evaluated the effect of TXA on bleeding in trauma. Basically the majority of what we do is from the CRASH-II study, which has been sub-analyzed several times. A second study set (MATTERs 1 and 2) are military registry studies that confirm effect, but probably aren’t as applicable to our population in the ED — (part E). Population: 20,211 patients with risk of or evidence for or suspected need for transfusion due to blood loss from trauma within 8 hours of injury. If the treating physician felt there was risk of significant hemorrhage**. ** This was a pragmatic trial where essentially it is meant for ease of use in the ED. à ISOLATED Intracranial Hemorrhage was an exclusion criterion based on prior poor outcomes (seizures and hematoma expansion) with medical SAH and postoperative cardiac patients who got similar medications or 2 – 10X doses of TXA. Intervention: Randomized tranexamic acid (loading dose 1 g over 10 min followed by infusion of 1 g over 8 h). COST of TXA per Year of Life gained: $64. Since the theory is this stabilizes clots, the concern would be too much thromboembolic disease in the treated group. Amount of blood given: 6.06 vs 6.29 Units – not significant. ?? So, if TXA is supposed to stabilize clots and decrease bleeding, but there was no difference in amount of blood transfused, why did it show a significant mortality benefit?? The best explanation I have heard is that it is an effect of survivor benefit – basically that patients in the TXA lived more frequently for longer, so they got the opportunity to get more blood products. 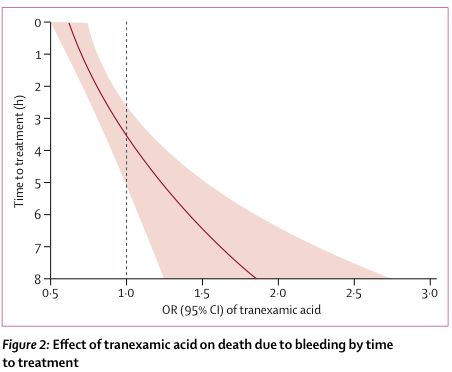 Conclusion: TXA has a small, but real 1.5% benefit in mortality in trauma patients with few dowsides. Conclusion: Use TXA as early as possible for the most benefit. If you think its needed, give it, don’t wait for a trauma surgeon to tell you to use it. This entry was posted in *PRACTICE CHANGING, Trauma and tagged Tranexamic Acid, Trauma, TXA. Bookmark the permalink.